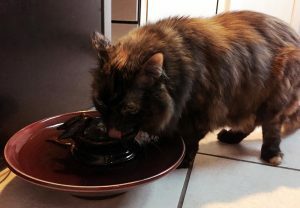 Cat Fountain Reviews. 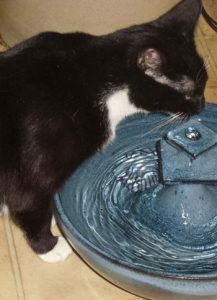 Read what our customers say about THIRSTYCAT FOUNTAINS. I have two and have just ordered one more. These are much easier to clean than other brands and stay cleaner between cleanings. The cat-safe materials give me peace of mind, too. They are also works of art. My cats love them. work of art & my cat loves it too! The first day or so Beaulah just looked at the fountatin. Like many cats she doesn't like change but now she loves it! The fountain is absolutely beautiful and I love that it's one of a kind, very special. She enjoys watching birds from a picture window at home and I thought this fountain was perfect because of the birds on it. And the colors are rich and bold. What I also like is that the pump could be set at different settings and was quite strong. Love it! Thanks! We and our kitties love the beautiful fountain. 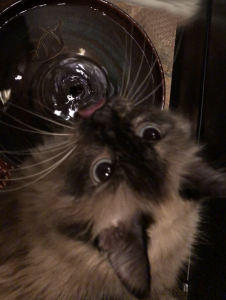 One kitty loves to drink out of the leaf on the top and the other drinks from the bottom. 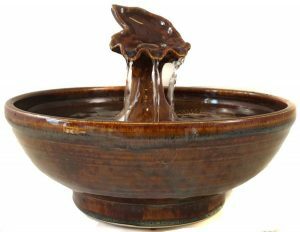 The fountain is gorgeous and adds beauty to your home. I am so happy I found your website and bought a fountain. It's easy to clean, maintain & also to reorder the charcoal and filters. Thanks again for making such a wonderful product. 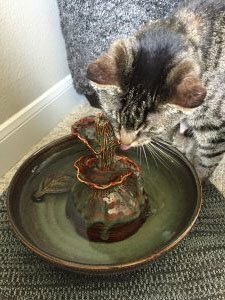 I am so excited to own a handmade Thirsty Cat Fountain , thank you a million times. 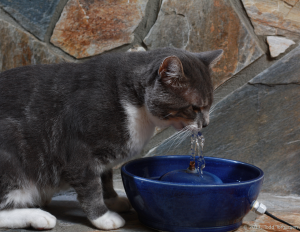 My cats love the fountain and drink more water now. The owners of the company go above and beyond in customer service. Initially I purchased a fountain with a tall centerpiece. 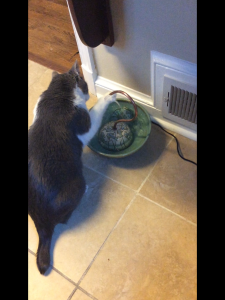 My cats started knocking it over. They let me buy a lower center. I accidentally cracked the pump cover and they sent a new one. When the pump wore out, they sold me a new one and helped me to install it when I had trouble following the printed directions. If only all merchants were like this. Received the Cat Fountain - very well packaged ! 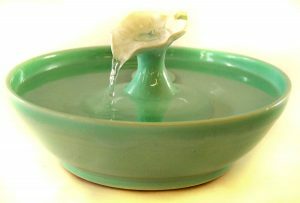 It is a beautiful piece of art as well as a useful water fountain for my cats. I adopted two short hair strays. At first they were curious, just watching the water flow! Now they both drink from the fountain instead of their regular water bowl! 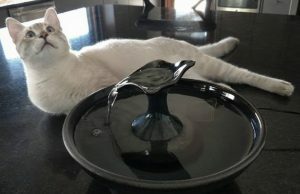 Enriching the environment is a big issue for indoor cats and this water feature fits the bill! 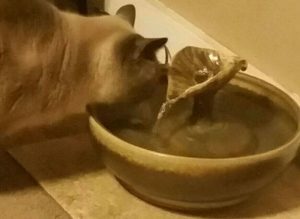 My cats love their fountains, and so do I. They are beautiful works of art, lovingly handcrafted to be safe for my fur babies and easy to maintain. The pumps are silent, so all you hear is the soft sound of the water. It only took a few hours for all six cats to adjust. Some drink from the bowl, some from the falling stream and some from the bubble-up point....but they are all drinking more and staying hydrated. Thank you for such a valuable service! !